Leonardo da Vinci's The Last Supper is one of the most admired, most studied, and most reproduced paintings the world has ever known. But no matter how many times you've seen it, we'll bet you don't know these details. 1. It's bigger than you think. Countless reproductions have been made in all sizes, but the original is about 15 feet by 29 feet. 2. The Last Supper captures a climactic moment. Everyone knows the painting depicts Jesus' last meal with his apostles before he was captured and crucified. But more specifically, da Vinci wanted to capture the instant just after Jesus reveals that one of his friends will betray him, complete with reactions of shock and rage from the apostles. In da Vinci's interpretation, the moment also takes place just before the birth of the Eucharist, with Jesus reaching for the bread and a glass of wine that would be the key symbols of this Christian sacrament. 3. You won't find it in a museum. Although The Last Supper is easily one of the world’s most iconic paintings, its permanent home is a convent in Milan, Italy. And moving it would be tricky, to say the least. Da Vinci painted the religious work directly (and fittingly) on the dining hall wall of the Convent of Santa Maria delle Grazie back in 1495. 4. Although it’s painted on a wall, it's not a fresco. Frescos were painted on wet plaster. But da Vinci rejected this traditional technique for several reasons. First off, he wanted to achieve a grander luminosity than the fresco method allowed for. But the bigger problem with frescos—as da Vinci saw it—was that they demanded the painter rush to finish his work before the plaster dried. 5. Da Vinci used a brand new technique on his future masterpiece. In order to spend all the time he needed to perfect every detail, da Vinci invented his own technique, using tempera paints on stone. He primed the wall with a material that he hoped would accept the tempera and protect the paint against moisture. 6. Very few of da Vinci's original brushstrokes remain. Although the painting itself was beloved, da Vinci's tempera-on-stone experiment was a failure. By the early 16th century, the paint had started to flake and decay, and within 50 years, The Last Supper was a ruin of its former glory. Early restoration attempts only made it worse. Vibrations from Allied bombings during World War II further contributed to the painting's destruction. Finally, in 1980, a 19-year restoration effort began. The Last Supper was ultimately restored, but it lost much of its original paint along the way. 7. A hammer and nail helped Da Vinci achieve the one-point perspective. Part of what makes The Last Supper so striking is the perspective from which it's painted, which seems to invite the viewer to step right into the dramatic scene. To achieve this illusion, da Vinci hammered a nail into the wall, then tied string to it to make marks that helped guide his hand in creating the painting's angles. 8. Renovations eliminated a portion of The Last Supper. In 1652, a doorway was added to the wall that holds the painting. Its construction meant that a lower central chunk of the piece—which included Jesus' feet—was lost. 9. The Last Supper's Judas may have been modeled after a real criminal. It is said that the look of every apostle was based on a real-life model. When it came time to pick the face for the traitorous Judas (fifth from the left, holding a bag of telltale silver), da Vinci searched the jails of Milanfor the perfect looking scoundrel. 10. There may be a biblical Easter Egg here. To the right of Jesus, Thomas stands in profile, his finger pointing up in the air. Some speculate that this gesture is meant to isolate Thomas's finger, which becomes key in a later Bible story when Jesus rises from the dead. Thomas doubts his eyes, and so is entreated to probe Jesus' wounds with his finger to help him believe. 11. The meaning of its food is up for debate. The spilled salt before Judas has been said to represent his betrayal, or alternately, is seen as a sign of his bad luck in being the one chosen to betray. The fish served has similarly conflicted readings. If it is meant to be eel, it might represent indoctrination and thereby faith in Jesus. However, if it's herring, then it could symbolize a nonbeliever who denies religion. 12. It's inspired some wild theories. In The Templar Revelation, Lynn Picknett and Clive Prince propose that the figure to the left of Jesus is not John, but Mary Magdalene, and that The Last Supper is key evidence in a cover-up of the true identity of Christ by the Roman Catholic Church. Musicians have speculated that the true hidden message in The Last Supper is actually an accompanying soundtrack. In 2007, Italian musician Giovanni Maria Pala created 40 seconds of a somber song using notes supposedly encoded within da Vinci's distinctive composition. Three years later, Vatican researcher Sabrina Sforza Galitzia translated the painting's "mathematical and astrological" signs into a message from da Vinci about the end of the world. She claims The Last Supper predicts an apocalyptic flood that will sweep the globe from March 21 to November 1, 4006. 13. The Last Supper also inspired popular fiction. And not just The Da Vinci Code. A pervasive part of the painting's mythology is the story that da Vinci searched for ages for the right model for his Judas. Once he found him, he realized it was the same man who had once posed for him as Jesus. Sadly, years of hard-living and sin had ravaged his once-angelic face. As compelling a story as this is, it’s also totally false. How do we know this story isn’t true? For one thing, it's believed that da Vinci took about three years to paint The Last Supper, mostly due to the painter's notorious tendency to procrastinate. For another, stories of spiritual decay manifesting itself physically have long existed. It's likely that someone along the way decided to saddle The Last Supper with a similar narrative in order to give its moral message a sense of historical credibility. 14. It's been mimicked for centuries. Fine art and pop culture have paid tribute to The Last Supper with a cavalcade of imitations and parodies. These range from a 16th century oil painting reproduction to new interpretations from Salvador Dali, Andy Warhol, Susan Dorothea White, and Vik Muniz, who made his out of chocolate syrup. 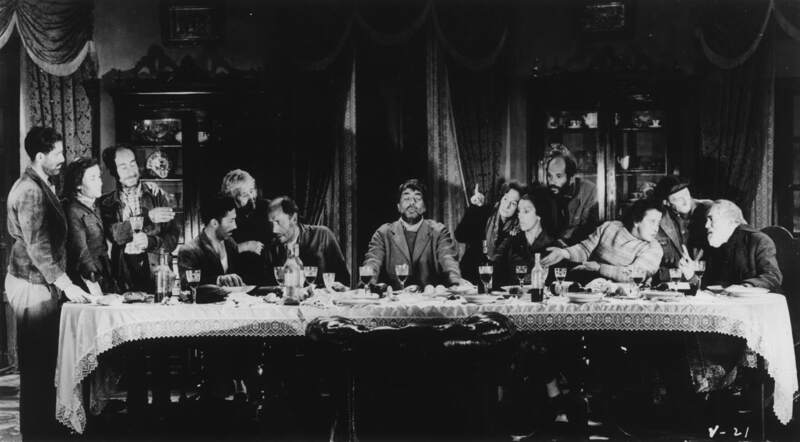 Recreations of The Last Supper's distinctive tableau can also be found in the Mel Brooks comedy History of the World, Part 1, Paul Thomas Anderson's stoner-noir Inherent Vice, and Luis Buñuel's Viridiana, which was declared "blasphemous" by the Vatican. It's also been a plot point in The Da Vinci Code and Futurama. 15. Want to see The Last Supper in person? Better book (way) in advance. Though The Last Supper is one of Italy's must-see sites, the convent in which it is located was not built for big crowds. Only 20 to 25 people are allowed in at a time in visiting blocks of 15 minutes. It is recommendedvisitors book tickets to see The Last Supper at least two months in advance. And be sure to dress conservatively, or you may be turned away from the convent.